Supersub Leon Bailey kept Bayer Leverkusen’s unbeaten run going with a brace, Bayern Munich’s Sven Ulreich has showed himself a penalty killer at former club VfB Stuttgart, and Cologne finally recorded their first Bundesliga win of the season: we round up the week's notable numbers from the final Matchday of 2017. Eintracht Frankfurt scored with their first shot on goal in both halves of their 2-2 draw with Schalke. Hertha Berlin’s 3-2 win in Leipzig followed a 3-1 win at Hannover, which is the first time in 2017 that the Berliners have won back-to-back Bundesliga games. Raffael scored his third brace of the campaign in Borussia Mönchengladbach’s 3-1 win over Hamburg. The Brazilian’s six goals so far this season have been spread over three games. Leon Bailey came off the bench to bag a brace for Leverkusen in their 4-4 draw with Hannover. His total of three goals as a substitute is a league best. Freiburg’s Nils Petersen, who netted twice against Augsburg, has scored in three competitive games for the first time in his Bundesliga career. The former St. Pauli, Bayern Munich and Werder Bremen striker has hit six goals in that time. Alfred Finnbogason has scored all three of Augsburg’s Bundesliga goals that have fallen inside the opening minute of games. The Iceland striker opened the scoring in the 54th second at the weekend, before scoring twice in second-half added time to rescue a 3-3 draw with Freiburg. As well as being the only team in the Bundesliga to have lost their last four, Stuttgart have failed to score in as many games, equalling an unwanted club record set in 2014/15. Freiburg are unbeaten in five successive matches for the first time in five years (W3, D2). Leipzig are without a win in five competitive games, which equals the club’s worst-ever run. They are now winless in four in the Bundesliga for the first time ever. 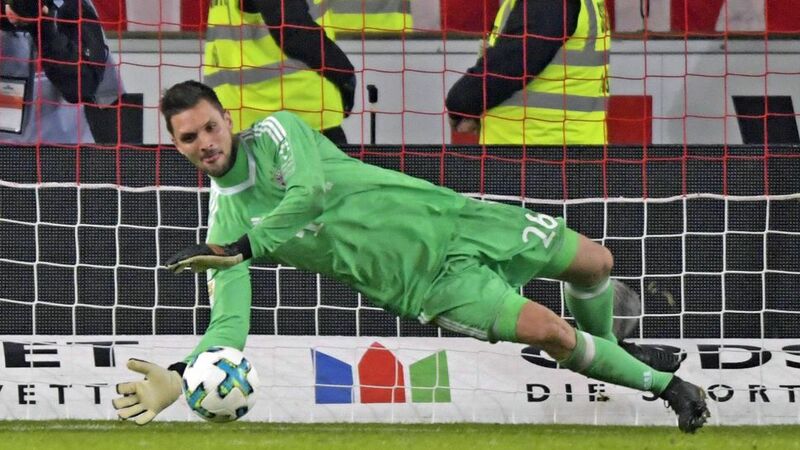 Bayern goalkeeper Ulreich saved his fifth penalty of the season in all competitions in the Bundesliga leaders’ 1-0 win at Stuttgart. Cologne are unbeaten in six games against Wolfsburg, following their 1-0 success on Matchday 17 (W2, D4). Hoffenheim surrendered a lead for a Bundesliga-high sixth time in their 2-1 defeat to Borussia Dortmund. The eight goals scored between Hannover and Leverkusen equals the record for a game this season (Dortmund 4-4 Schalke). The five goals in the first half is an outright record for any half this season though. Nine goals fell in stoppage time. Hoffenheim are winless in nine Bundesliga meetings with Dortmund (D4, L5). Hamburg have lost all 10 of the games in which they have fallen behind so far this season. Frankfurt scored inside the first minute for the 11th time in their Bundesliga history. Historically, it was also the 11th goal Schalke have conceded in the opening minute of games. Hamburg’s Andre Hahn ended a run of 12 games without a goal with his effort against former club Gladbach. Leverkusen are unbeaten in 12 Bundesliga games (W6, D6), which is the longest current run in the league and Die Werkself’s longest in eight years. Mainz are winless in a club-record 14 away games. Bremen’s 15-point return is their worst ever after 17 matches. They also occupy their lowest ever position in the standings at this juncture (16th). Bayern have won their last 16 competitive games against Stuttgart, 13 of which were in the Bundesliga. Cologne’s first win of the season came on Matchday 17. The Billy Goats have never had to wait so long to pick up three points. Bayern have not lost their final league game of a calendar year in 33 years. The 36 goals scored on Matchday 17 was the most this season as the Bundesliga said farewell for the winter break. Christian Streich oversaw the 50th draw of his career as a Bundesliga head coach. Naldo rescued a point for Schalke with his 95th-minute equaliser - just as he did against Dortmund. Gladbach match-winner Raffael produced his first Bundesliga assist in 643 days.